Punjab Local government has announced to get started with a new Drive for the local people. With an aim to help offer guidance to the young youths of the state the government shall be organizing a Job fair for the people in the state. According to the sources, the Job fair organized is being hosted for second year in a row in the state and is themed Ghar Ghar Naukri 2019. The fair has been organized for conducting job interviews for the unemployed youths. 4. Power Minister Rana Gurjit Singh. The Industrial Training and Technical education Minister of the state had made the announcement for launch of the Job fair on 2019. The Minister and state government has announced to organize the fair in over 22 locations state wide. Apart from this the fair shall also be attended by leading companies and organizations and designated officers. Objective: The objective of this scheme is mainly employment generation. Mr. Manpreet Singh also assured the industrialists that they will set up many employment opportunities in the state. Need for scheme: This scheme comes at a time when a large part of the bright students of the state are settling in foreign countries because of lack of employment schemes in the state. To avoid this, the state shall try to create more opportunities within the state. According to regulations the candidate has be minimum graduate to participate in the job fair. Apart from this post graduate candidates who are pursuing their degree course can also participate in the fair. Any candidate who is availing IIT, Diploma or equivalent degree can also participate in the job fair for interview session. 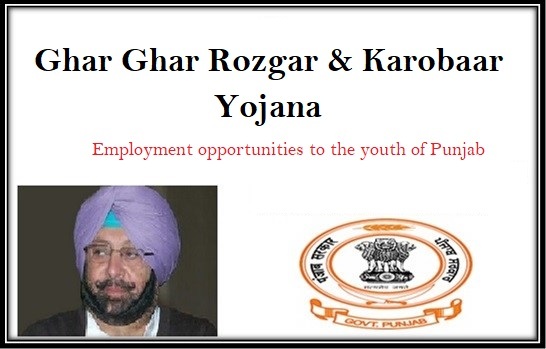 To get registered the candidates have to log on to the official website at http://www.ghargharrozgar.punjab.gov.in. Once on the home page you will have to make the selection of register option for registration process. From the main page you have to select the register here option that is located at the bottom of the page. You will be displayed with the registration form where all details are expected to be filled in by the candidate. On the application form candidates have to provide with personal information, education qualification and bank details along with any employment details if employed currently. Once the details have been submitted you will be provided with OTP on the registered mobile number. They also have to provide with details of their email id. The OTP can be used to log in officially on the website. The candidates will have to upload documents and complete the profile page. Candidates can also request for a print copy of the application form for future reference. They may also have to submit a copy of their updated CV. The candidates are also expected to under go screening process during interview session and selected candidates will receive confirmation letter from the organization once the fair is commenced. The letters will be given away by CM Amarinder Singh at Ludhiana job fair. Vocational education: Channi announced at the event that to take the scheme forward the government would set up vocational education. This would help bridge the gap between professional education and academic studies. In turn, the student can find jobs easily. Employment fairs: He also announced that the government will organize employment fairs with which they will be able to provide jobs to about 50,000 youths in the state. This event will take place across 21 areas in Punjab. Emphasis on: MR. Channi also revealed the framework on which this scheme is going to be built. It shows an increased emphasis on synergizing skills, enterprise development and employment which will help achieve the objectives of the mission. District partnership with CII: Each district will have its own guidelines and roadmap on how to provide employment to the youth. The Employment Bureaus at Mohali, Ludhiana and Jalandhar will set these up in partnership with the CII. Punjab economic boost: This drive will also help boost the economy of Punjab. Mr. Badal announced at this event that this scheme aims to make the future of Punjab and economically well off one. Number of students: Approximately 2.80 lakh unemployed youth will receive training under this scheme. Among these, 50,000 students are to get immediate employment opportunities in spaces including state organizations and government departments. Expected salary package: The salary packages included in this scheme would range between Rs. 1.25 lakh to Rs. 21 lakh per annum. The state signed 34 Memorandums of Understanding (MoUs) with various employers and industrial organizations on this date. With these, the government has joined hands to provide employment under this scheme. The Department of training and employment had announced for organizing the fair that will be conducted on 2019. The visitors can participate in the fair from 10AM to 5PM. To be a part for the fair and to participate for interview sessions you will have to register online over the website. As a part of the drive to help the unemployed youths get jobs, the government will be organizing the fair. The government has also made it clear that employers would be providing with skill training techniques to the youths for candidates who have registered online. To participate in the fair the candidates will have to register well in advance on the official website mentioned above. This scheme will bring forth a drastic change in the economic scenario of the space. It will also ensure that a lot of unemployed youth find jobs within the state and that they do not have to go abroad in search of opportunities. 30th July will mark the beginning of an International Job Fair in Chandigarh. Skill Development and Entrepreneurship Ministry, National Skills Development Corporation and Tourism and Hospitality Skill Council have organized this job fair jointly. It will take place on Government College ground at Mohali. This job fair will be attended by representatives of companies located in UK, Dubai, Ireland, Kuwait, UAE, Kuwait, Oman, Bahrain Oatar and other nations. It is the perfect opportunity for those youngsters who have necessary qualification and desire to get a job abroad. Around 6000 deserving applicants will be able to bag a job from this fair. Apart from technical fields, candidates will be recruited for hospitality, nursing, housekeeping and other sectors.